The SBI Bluechip Fund is an open-ended, equity mutual fund that primarily invests in equity and equity related instruments of large-cap companies. The fund is actively managed and can dynamically change its asset composition to suit prevailing market conditions. The fund seeks to provide investors with long-term capital appreciation and regular income while mitigating risks associated with exposure to market instruments. The SBI Bluechip Fund was launched in February 2006 by the SBI Mutual Fund House. 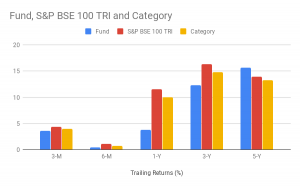 As the SBI Bluechip Fund is an equity mutual fund, it carries risks due to its exposure to equity, but as the fund primarily takes exposure to large-cap stocks it is relatively stable when compared to mid-cap and small-cap funds. This fund is suitable for investors that have a moderately high risk appetite and long investment horizons of at least 3 years. The SBI Bluechip Fund is a large-cap oriented fund but also makes marginal investments in mid-cap and small-cap company stocks to bolster returns. The fund also makes marginal investments in debt and other money market instruments to provide the fund with good liquidity, investors with regular incomes and a level of stability during volatile market cycles. The asset allocation of this fund according to its mandate has been provided in the table below. 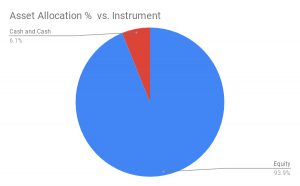 The present asset allocation of the SBI Bluechip Fund has been provided in the chart below. The SBI Bluechip Fund is a highly diversified equity mutual fund that carries a large-cap bias. The fund mainly invests in stocks of companies that are engaged in the finance sector of the economy. 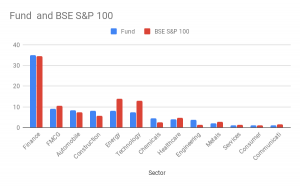 The SBI Bluechip Fund distributes its investments across 53 stocks, with its top 10 stocks making up approximately 43% of the entire portfolio. The fund makes investments in large-cap stocks to the tune of 88% and the remainder in mid-cap stocks. The fund takes a very marginal exposure to small-cap stocks. Presently the fund makes investments in the Finance, FMCG, Automobile, Construction, and Energy sectors of the economy. The sectoral allocation of the fund against the S&P BSE 100 index has been provided in the chart below. The SBI Bluechip Fund is a strong performer within its category. The fund was launched in February 2006 and has outperformed its benchmark and category on a number of occasions. The fund has been unable to beat its benchmark or category in investment cycles of 3 years or less, but in investment cycles of 5 years or more this fund outperforms both its benchmark and category. Historically, the fund has performed well in bullish cycles and between March 2009 and March 2010 this fund put out its best performance, outperforming both its category and benchmark by a considerable margin. The performance of this fund against its benchmark and category has been provided in the chart below. The SBI Bluechip Fund seeks to provide its investors with long-term capital appreciation and regular income through systematic investments in equity and equity related instruments of predominantly large-cap companies. The fund is actively managed and can, therefore, change its exposure to suit prevailing market conditions. The objective of this fund does not guarantee that it will achieve it, it determines the core purpose of its investments. The SBI Bluechip Fund employs a blend of growth and value styles of investing, seeking overvalued stocks as well as undervalued stocks to provide the best returns. The scheme also uses a combination of a top-down approach and a bottom-top approach to pick stocks from companies across market sectors. The fund carries a large-cap bias i.e. the fund predominantly invests in stocks of large-cap companies. SEBI defines large-cap companies as the top 100 companies in terms of full market capitalization.